Email marketing campaigns? The personalization of the email design service is must. Wait! What did you understand with the personalization? Of course, including the first name to the email subject line and textual body, right? Yes. It is the good strategy actually, although there are many more email personalization strategies. Not all customers like to read their first name, though it makes them important. When you make the customer sign up for your brand’s newsletter, based on the details provided by them on the form, you can personalize the email templates with such information. We have shared the six forms of the email personalization for your brand. How would you feel when someone remembers your birthday/ anniversary? It is the fabulous feeling. Not only this, also when the brand remembers when did you had joined them, you will feel like the family. Pizza hut did the fabulous task by sending the birthday personalized email to the customer with the small cupcake candle on it. To the customer, Pizza hut has offered the free cinnamon sticks if they place an online order on their special day. This kind of the personalized email not only promotes the new food item from the menu but also makes it easy for the customer to know what is in the store for them on the special day. It is the best thing you can give it to the customers who has been associated with you since long time. The loyalty rewards is based on the segmented email list generated by the brand which further depends upon the consumer’s behavior. Here, we think Starbucks is doing the great job by providing the loyalty rewards to the customer who is associated with them since long time (at least 4-5 visits per month). 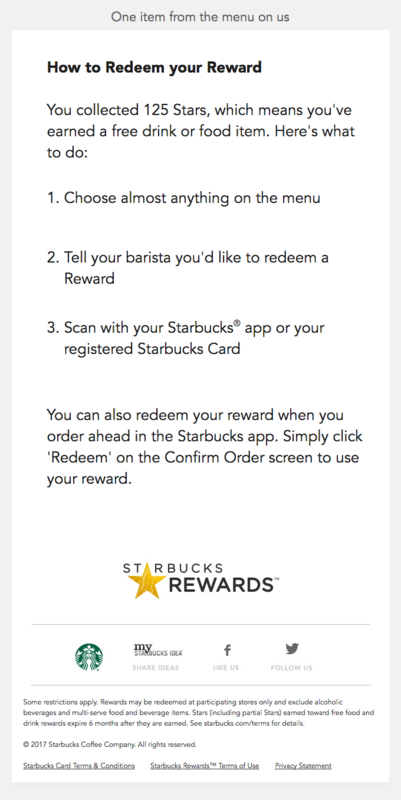 Not only they have sent the loyalty reward, Starbucks laid down the guidelines for how to redeem it. Loyalty rewards are for the customer’s willingness towards the brand which is because of the great customer experience and the product/ service satisfaction. The loyalty rewards on the personalized emails is the sign for the brand’s growth and the expansion to promote about on the social media. Have you ever noticed the consumer behavior on your website? Did they looked for the particular product again and again, looking at the features, changing the price range, color of the product and many such bifurcations? Applying all kind of the filtrations and yet the customer did not take any action? All such actions and the behavior/ habits can be tracked down, making it useful data for you to personalize the email for sending it to the customer. This will help you to segment the email list on the basis of the behavioral aspect of the customer, making it easy for them to offer the range of the products under similar behavior. By understanding the consumer behavior, the Shazam has personalize the email template introducing the new features of searching the TV shows and also the right music. This kind of the personalization helps the user to learn the other features, including the newly launched one. The exploration of the application continues along with the primary feature as well. When the customer change the location; certain brands, particular transportation service provider send the personalized emails to them, ensuring the customer about their prevalent services. This particular personalization depends whether the brand has the service providing platform/ option to the city where the customer has moved in. Such personalization makes the user relieved to know there is someone they can look upon for the particular service/ product. This personalized email from the Lyft, the popular cab service provider in the USA is send to the customer who is in Chicago providing the information about the difference in the tariffs between the Taxi service and the Lyft cab service to the popular destinations inside the city. Not only this, they have provided the customization option to the customer to know the estimated fare to the particular location. This is the core aspect for personalizing the email templates with the customer’s important information- which can be either based on their behavior or the data extracted from them. While the brand takes care of the customer- completely; there are minor things about them which can be taken under consideration. Just like the Apple music subscription. To listen the updated and latest music on the Apple, customer has to subscribe to it by paying the specific amount. 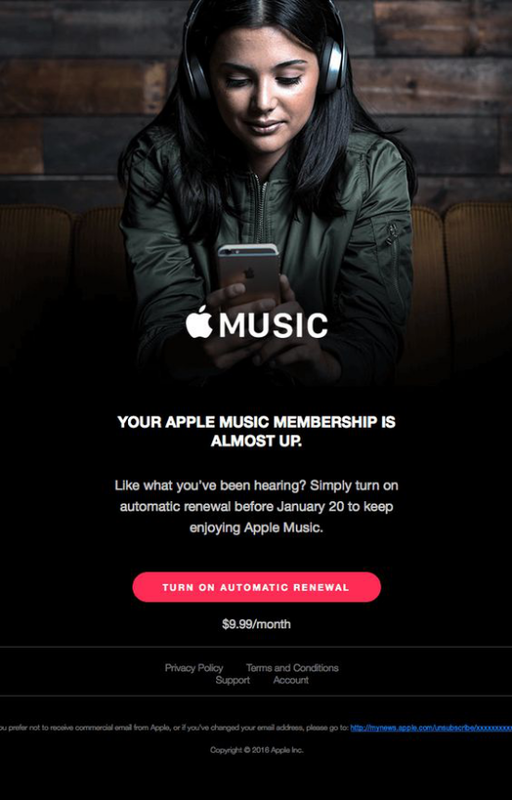 In the personalized email template, it is quite visible how the brand Apple values the user’s interest and based on the information like when it had subscribed to the Apple Music, the reminder email is sent for the renewal as the subscription is near to the expiration. With the appropriate call to action ‘TURN ON AUTOMATIC RENEWAL’, customer finds it easy what they have to do to extend it, although the decision is on them at the end. Along with the CTA, the information regarding the price is also mentioned so as to make it easy for the user to decide. There are many more ideas and the guidelines for how to personalize the emails so that the customer engagement increases and also the conversion rates soars high in the email marketing campaigns. When personalized, the chances of the brand to create the bond with the customers not only lasts but also grows strong.